A wealth of complimentary amenities and warm hospitality a wait at our beautiful hotel. Guests will look forward to a full American breakfast- wifi- parking- and weekday managers reception as well as an escape into old world European-inspired charm. 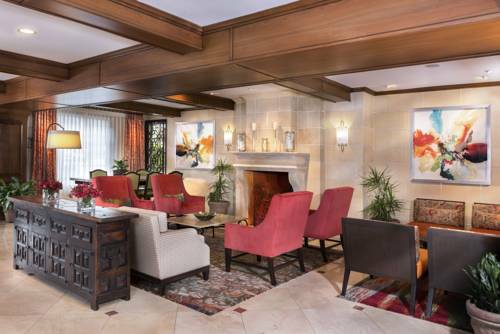 Genuine artwork and European-inspired flare adorn the halls of this 133 room property conveniently located just steps from Honda center and angel stadium. Perfectly situated in Anaheim- Ayres hotel also proves a favorable location for a visit to all of southern Californias premier attractions- including Disneyland resort- outlets at orange- knotts berry farm and so much more. Guestrooms are outfitted with the most desirable creature comforts including plush ayres dream sleeper mattresses- microwaves- refrigerators- flat screen TVs- wet bar- satellite TV- mp3 player/alarm clock- coffeemaker and much more guaranteeing the most comfortable stay possible whether traveling on business or pleasure. Ayres Hotel Anaheim - the perfect combination of service- style- and location. Anaheim California. Located in the center of Orange County. Easily accessible to 5 major freeways. Within 5 minutes of Disneyland the Convention Center honda center and Angel Stadium. All reservations must be guaranteed at the time of booking by credit card with valid expiration date. Exceptions may apply during holidays/special events or conventions - see rate rules. Must cancel 24 hours prior to scheduled check in time of 3 pm to avoid a penalty of one nights room and tax. Exceptions may apply - please see rate rules. Cuisine type - California Micro Brewery. Location -open from 1130am-11pm. Located across the street.